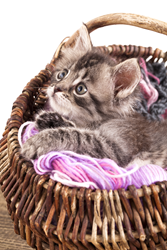 Cats eating string is a common pet insurance claim. Furby, a Pets Best protected cat, has had to have string he ate surgically removed three times. Cats are curious and adventurous animals, and their behavior can often lead to injuries and accidents that are costly to treat. Pets Best Insurance Services, LLC (Pets Best), a leading U.S. pet insurance agency, today released a list of the most bizarre cat insurance claims recently submitted to the agency. Although the agency’s most unusual claims often stem from canine companions, felines have also generated a wide variety of surprising claims as a result of hazardous whims. Indoor and outdoor cats can experience a wide range of health issues. Pets Best offers a variety of pet insurance plans, including the BestBenefit plan, which covers the diagnosis and treatment of hundreds of accidents and illnesses. For cat owners specifically worried about the illnesses their cat may experience, the Feline Illness plan covers some of most expensive and common cat illnesses. The 21 conditions covered include diabetes, chronic kidney failure, hyperthyroidism, cancer, arthritis and heart disease. The Feline Illness plan starts at $5 per month. For more information about Pets Best, visit http://www.petsbest.com. Dr. Jack L. Stephens, president of Pets Best, founded pet insurance in the U.S. in 1981 with a mission to end euthanasia when pet owners couldn’t afford veterinary treatment. Dr. Stephens went on to present the first U.S. pet insurance policy to famous television dog Lassie. Pets Best provides coverage for dogs and cats and is the only veterinarian founded and operated pet insurance agency in the United States. Dr. Stephens leads the Pets Best team with his passion for quality pet care and his expert veterinary knowledge. He is always available to answer questions regarding veterinarian medicine, pet health and pet insurance. The Pets Best team is a group of pet lovers who strive to deliver quality customer service and value. Visit http://www.petsbest.com for more information.